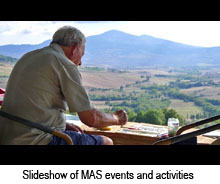 Events section last updated in October 2018. 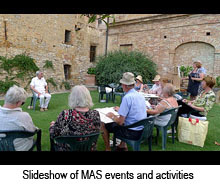 To read about the Medical Art Society Painting Week in Taormina click here. This is the society's main event each year. 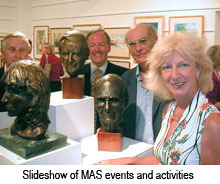 For the last few years it has been held in the Atrium of the Royal Society of Medicine in Walpole Street, London. These are held, sometimes with a tutor, once a month during each winter and spring. 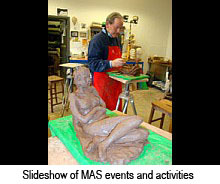 Smaller exhibitions, gallery visits, talks and concerts. 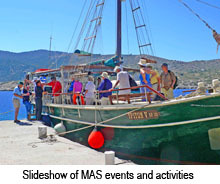 Many smaller and very much enjoyed events take place throughout the year. 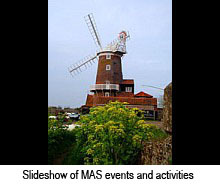 These, whether large or small events, are organised by members and are much appreciated by other members and their friends. Joint activities with our Dutch colleagues. 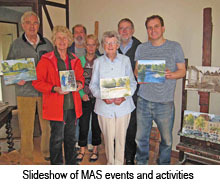 Society members are now invited each year to painting breaks in Holland organised by the members of the Dutch medical art society known as 'Pincet en Penseel'. Sessions will be at the London Sketch Club, 7 Dilke Street (off Tite Street), Chelsea, London SW3 4JE on the following days from 10am to 4:30pm. There is free Sunday parking nearby. The fee per session this year will be £35 (£40 for non members). There are tea and coffee facilities but no cafe at the club, so bring a packed lunch or maybe eat at the Army Museum in Royal Hospital Road. Many thanks to Johny Wakeham for organising this, as well as managing our finances as Hon. Treasurer. The 2019 AGM will be held on Monday May 13th at 2pm at Lettsom House (Medical Society of London) 11 Chandos Street, London W1G 9DP. It will be preceded by a free lunch and followed by a lecture, as before. 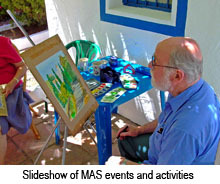 The MAS arranges a week every year to go painting in a warm and pleasant location, where there is enough material to stimulate members to produce some paintings and further their creativity for the coming year. This year we went to the town of Taormina in Sicily. This little town is on the coast just below Mount Etna, which is still active, and offers a mixture of village scenery, sea views and views towards the volcano. We chose to go for the first week in June before it gets too hot for comfort, and while the restaurants and tavernas are still welcoming and looking for business. We stayed at the Taormina Park House, a family run hotel close to the centre of town. It is opposite a beautiful garden, originally built under the auspices of an English lady who loved the town. 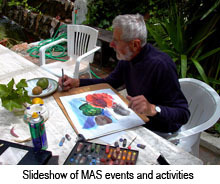 This garden provided an ideal area within a short walk to do a water colour after a day’s exploration. The day after arrival we had a guided tour of the town which gave us our bearings and an understanding of its history. The next day our guide took us to the Graeco-Roman theatre, which is indeed a marvellous sight and in every tourist brochure. The day after that we took the local bus up to a small village which has a view across the bay. The bus ride is an experience in itself, as the driver manoeuvres his vehicle between parked cars and delivery vans while his passengers cling to the seats. They finally arrive in the village square ready for a stiff drink. Every day Taormina provided an exciting view to be captured and the week passed all too quickly. People chose different subjects for their paintings, while some of the non-painters decided to go along the coast to Syracuse. Freedom to do as you choose is part of painting holidays, but in the evenings we all met for a pre-prandial drink in the hotel garden before strolling into town to one of the many restaurants. We ate good fresh Sicilian food washed down with very acceptable Sicilian wine. Coping with a party of eleven people proved to be no difficulty for these small restaurants, and the time passed quickly before we ambled back for a nightcap. Mediterranean holidays always run the risk of airlines holding a strike in the holiday season. We had to take a bus to Palermo to get home, but our travel agent did a wonderful job at rearranging flights, at no extra cost but a little later than scheduled. 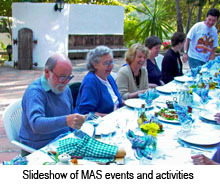 Such setbacks do not affect the hardy members of the MAS. In June 2019 we shall be setting off for a week in Dubrovnik – make a note in your diary and join us!